Bees won't move down in Warre. Help needed getting bees to build into bottom box. 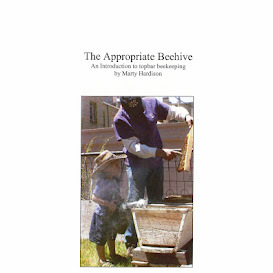 The problem of getting a colony to grow in a Warré hive is discussed frequently in the beekeeping forums. The conversations address why they stall and what might encourage them to build down (or up), but Warré beekeepers tend to subscribe to a somewhat laissez-faire method of beekeeping, and advice on feeding a single-box colony is vague at best. Today's post is a progress report of sorts, depicting our feeding program. We gave our colony their first solid meal on Thanksgiving and have been taking the roof off the hive every 10 or 15 days since! Not ideal, but it's been necessary. At first it was maintenance feeding (with just fondant) but now I'd call it emergency feeding, with both fondant and MegaBee Hybrid pollen substitute. By rule of thumb, February and March is when colonies starve; they're growing, stores are depleting, and there are no natural foods sources yet. Our colony will not survive without help. I chose the images in the slideshow to illustrate a) how much food fits inside a feeding rim and b) how quickly the bees consume fondant and pollen substitute patties. It's been driving me crazy that all I can find is general instruction to "replenish as needed." How is that helpful? I hope you find this information useful. P.S. : I've had some trouble with my fondant, which I'll fess up to later. Basic Beekeeping Lesson 30: bees need pollen patties no later than Feb. 1st. Pollen patties will stimulate the queen to start laying more, while providing the bees some nutrition. N.B. : Once you start feeding, you must continue until natural pollen and nectar is available. ANOTHER NOTE: by fooling the colony with patties and sugar water, hives may came out of winter overcrowded, ready to swarm. Be prepared to split.